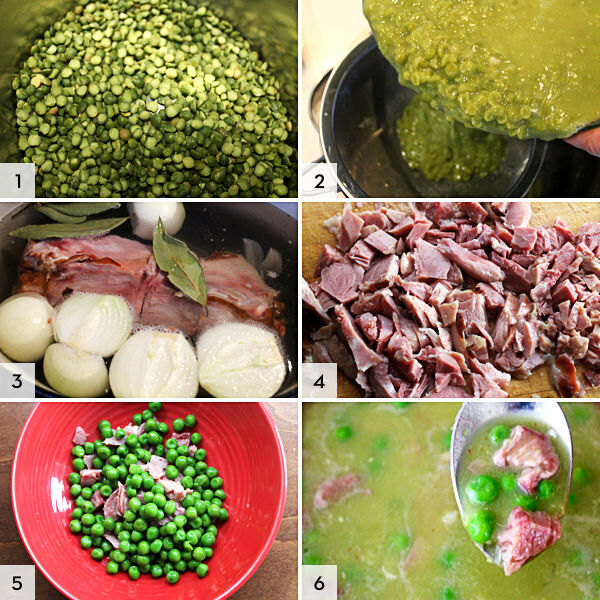 Peas and ham are the ultimate food partners, most particularly when the peas are split, long cooked and mushy, and the ham has been pulled off the bone, after the bone has given its all to the stock. The mushy peas are also part of that strange South Australian icon, the pea floater, a concept that, remarkably, has made its way into revered status in that quirky state, with a stamp from the SA National Trust. The pie floater is nothing more than a meat pie, floating in mushy peas, and topped with tomato sauce. It may well be called a floater, but those of us of an undisciplined nature will know it better as a drunk’s salvation. I love the guesswork involved in the birth of the pie floater. The SA Trust suggests that the ‘dish’ was possibly born in Port Pirie, when a bloke called Ern Bradley may have “inadvertently dropped a pie into a bowl of soup”. That fits with my thinking about the floater being more a drunk’s salvation than gourmet’s delight. The pie floater came to life a long time before the Thermomix, maybe 150 years ago, but there may not be any better ways to concoct the mushy peas than in the Thermomix. Just twiddle a few knobs, or press a future buttons, and the job is done for you. I was thinking of lost nights outside the Adelaide railway station, years ago, when the Thermomix was churning out the pea mush that makes up the base for a stylish pea and ham soup. In this case, strong drink wasn’t involved and nor was a meat pie: it was all about making the most of the Thermomix’s charms to create a classic pea and ham soup. Enough water to cover the hock, perhaps two litres. A handful of fresh podded peas (or frozen) for each portion, cooked quickly. 1. This is not a quickie. Like most slow-cooked dishes, it’s best to make the stock a day before to allow any fat to rise to the surface, so the excess fat can easily be removed. 2. Cook the peas and make the stock at the same time. Add the split peas to the Thermomix bowl, (1) with 1400 grams of water, and cook 40 minutes/100 degrees/reverse/speed 1. The peas are done when they are soft and mushy (2). Drain any excess water. (At this stage, you’ve got the floater, by adding 50 grams of butter, squeeze of a lemon, and season well with salt and pepper.) Set aside in the fridge. 3. Add the onions, garlic, carrots, celery, garlic, and bay leaves to the hock, and cover with water in a heavy-based pan (3). Bring to a simmer, and cook gently for at least an hour, or until the ham comes easily from the bone. Drain and place in the fridge for several hours, until any fat has risen to the surface. This stock is the key middle flavour of the ultimate soup. You should have around a litre of stock after draining. Retain, and when cooled, remove the fat. Remove the meat from the bone (4). Find a disgruntled dog, and give the dog a bone. 4. Add the mushy peas (which should be around 1000 grams) to the Thermomix bowl, and add 500 grams of the ham stock, and blend 20 seconds/speed 5. If you prefer a thicker soup go easier on the stock. Heat through 3 minutes/100 degrees/speed 1. Taste for seasoning. 5. In each bowl, add a handful of the warmed through cooked peas, and a similar amount of the shredded ham (5). Pour over the soup, and serve with best bread.